John Stevens Berry received his first Sherlock Holmes book in the fourth grade. His father gave it to him, along with a nice baseball glove. "(The stories) were a little advanced for a fourth-grader," the Lincoln attorney admitted. "But I could, after turning some pages, get a sense of the adventures." By the seventh grade, Berry had read them all. He, like so many before him, found himself enveloped in the London fog, hearing the clip-clopping of horse hooves on the cobblestone streets. Berry enjoyed the chase, with Holmes and Watson in pursuit of some nefarious criminal, often with Holmes noticing the slightest of details to help him solve the crime. "Some liked the Hardy Boys or Horatio Hornblower, but for me, Sherlock Holmes was the great hero." He may be again for many, many more, thanks to Hollywood. Sir Arthur Conan Doyle's legendary detective lives again in director Guy Ritchie's new movie, which opens in theaters on Christmas Day. 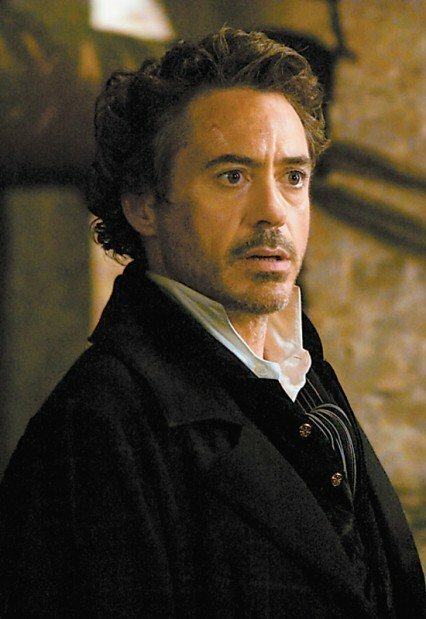 Robert Downey Jr. plays Holmes as an action hero, with his skills as a boxer and martial artist as important to the story as his cerebral talents. Jude Law portrays his faithful friend and companion, Dr. John H. Watson, who is just as adept as Holmes with his fists and firearms. Ritchie stays true to his source material, populating his movie with myriad characters from Conan Doyle's stories, including Irene Adler ("The Woman"), Inspector Lestrade and, of course, the notorious Professor Moriarty. Downey Jr. is the latest in a long line of actors to play Conan Doyle's detective. Holmes has been consistently listed in the Guinness Book of World Records as the "most portrayed movie character," with more than 70 actors playing the part in 200-some productions. That's not surprising since Conan Doyle's stories were so incredibly popular. The Scottish author and physician penned four novels and 56 short stories that featured Holmes. The first story, "A Study in Scarlet," appeared in Beeton's Christmas Annual in 1887 and Lippincott's Monthly Magazine in 1890, respectively. Most of the stories cover a period from 1875 to 1907, with Holmes' final case in 1914. Watson narrates all but four stories. Conan Doyle said Holmes was inspired by Dr. Joseph Bell, for whom Doyle had worked as a clerk at the Edinburgh Royal Infirmary. University of Nebraska-Lincoln English professor Laura Mooneyham White said Holmes' debut coincided with a shift in British literature. In the late 19th century, there was a split between writers appealing to the large middle-class reading public and writers of the avant-garde. Conan Doyle was one of those authors who staked his claim as a writer on thrilling the ordinary public. "The elites were still reading Robert Louis Stevenson and Rudyard Kipling, too," White said. "But it was something of a guilty pleasure." While quite profitable, Conan Doyle tired of writing Holmes stories. He even tried killing off his hero, when he sent him and the evil Moriarty plunging into the Reichenbach Falls in "The Adventure of the Final Problem." "He wanted to focus on his historical novels, but they weren't selling the way Holmes was selling," White said. This period, roughly from 1891 to 1894, is referred to by "Sherlockians" as "The Great Hiatus." The detective reappeared in "The Adventure of the Empty House." So is Conan Doyle as relevant to British literature as Dickens, Stevenson and Kipling? White say yes. She teaches 19th and 20th century literature at UNL and includes the author's works in her classes. "He is important in literature because he (created) the first major detective in English literature," she said. "Other people were writing detective stories, but Conan Doyle crafted the one, Sherlock Holmes, who became a staple of everyone's imagination." Conan Doyle's detective became so popular that fan clubs formed, with its members sharing their passion for the stories. Berry is a member of the Maiwand Jezails, the Nebraska scion society of the Baker Street Irregulars, a fan club formed in 1934 that is considered the preeminent U.S. Sherlockian group. Berry is the only Nebraskan who also is a member of the Irregulars. The Jezails, founded by the late Wayne State College professor Richard Lesh in 1963, takes its name from the weapon that wounded Dr. Watson in the Battle of Maiwand during his military service in Afghanistan. The Nebraska scion is unique because it has no officers (only a commandant), dues, minutes, newsletter or committees. It's limited to men only. The Jezails meet at the whim of the commandant, from one to three times a year. Meetings include cigars and cognac at the table, printed programs, and every table is full service with flowers. A table is set for Holmes and Watson. There is never a head table. Always displayed are the two icons of the group: a 200-year-old jezail rifle and the painting "Saving the Guns at the Battle of Maiwand." The Jezails welcome those who express a sincere interest in things Sherlockian. Dilettantes are shunned. The group also is unique because actor Basil Rathbone visited it in 1965. Rathbone portrayed Sherlock Holmes in several movies in the 1930s and '40s. It's believed the Nebraska fan club is the only one that Rathbone ever visited. Lesh had convinced Wayne State to invite the actor to campus as one of its speakers. Once there, Rathbone agreed to join the Jezails for dinner and a meeting. Berry joined the organization in 1972 when he moved to Lincoln from New York City. Knowing his passion for Sherlock Holmes, Berry's mother had sent him newspaper clippings about the Jezails. 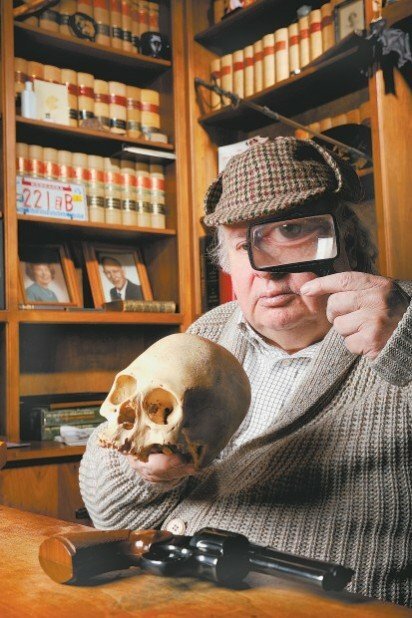 His law office has two bookshelves full of Sherlock Holmes stories. Berry's wife, Margaret, painted a portrait of the detective that hangs across from his desk. His license plate reads "221B," for Holmes' address. "I delighted in the tongue and cheek scholarship and British humor of it all," said Berry, who noted Jezail meetings include presentation of papers concerning Doyle's stories. "I enjoyed the general goodwill and the sense of fun." Berry, for one, is eager to see the Ritchie film. "Of course, I've never missed any the movies," he said. "I think Basil Rathbone was and will remain the greatest Sherlock ever." Reach Jeff Korbelik at 473-7213 or jkorbelik@journalstar.com. Television has been a playground over the years for Sherlock Holmes-like "consulting detectives." 3. Patrick Jane, "The Mentalist"
6. Dr. Cal Lightman, "Lie to Me"